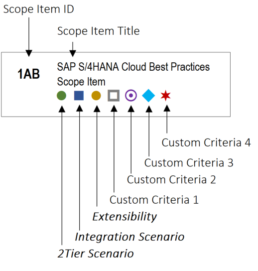 A key piece of information that I use in my interactions with customers, is the SAP S/4HANA Cloud Best Practice practices content, for which I am sure you have already heard the term scope item. If not then head on out to the Best Practices Explorer for SAP S/4HANA Cloud portal (note you need to log on with your S-User to access the rich library of accelerators). To be more specific, I like to use a graphical view of our best practices, because I find that a picture really does paint a thousand words. It is a great conversation piece that I use before, during and after a project. However, with the ever increasing number of scope items and country localisations that come with every new quarterly release of SAP S/4HANA Cloud, trying to build a graphical view of a scope map becomes a tedious and time consuming task. What’s more when I talk to my customers, I want to provide them with content that is specific to them : Show them a scope map of those scope items that apply to them, for their chosen country localisation(s) and/or presented in such a way that lets them take in what they are using, yet also, more subtly shows what is available to consume if and when they will have the need for additional functionality. Furthermore, a scope item may not be released in all countries – for example there are some statutory reporting capabilities that are specific to a country. There is no added value for my Japanese customer to know that the US 1099 tax reporting is not available for country Japan. Again, the idea is to offer something that is personalised to the customer. With that in mind, not wanting to become an Excel or Powerpoint jockey, I decided to come up with a tool that would help me in this task of producing customer specific Best Practices Scope maps. That said, the tool could also be used by partners during their engagements with customers to for example highlight specific services or know-how that they have in certain areas, or customers themselves to for example help them keep track of their used scope and / or build future state roadmaps. This tool is an Excel based tool that will produce Scope Items maps in Excel and, optionally can also generate a set of Powerpoint slides, if you needed to wrap them up nicely in a presentation. In Excel, there will be one worksheet generated for each business area selected, and in Powerpoint there will be one slide for each scope item group as well as one slide per business area. And example of both these displays is shown below. Once you download the zip archive and unpack it, you should have two files. An Excel document (this is the core file), as well as a Powerpoint template file named “Template.potm”. This is a blank Powerpoint Template file that will be used when you generate your personalized scope map. You can use your own template (with your own company colours and formatting) if you wish to. TO do so place your own temaplte file in the same folder as the excel document, and name your template”Template.potm” because that is hard coded in the macro – that is the name and place it looks for it. Also, I would recommend that you do not execute the macro whist the documents are stored in a dropbox or onedrive folder location especially if you have a less than optimal bandwidth. I have found that trying to run the macro as well as update the file live in such a network folder leads to periods of – long – unresponsiveness. The first thing that you will need to do is decide whether you want to see a generated scope map independent of a country localisation, or on the contrary you want it specific to a country. The main difference between these two selections is that the country specific map will grey out those scope item that are not available in the chosen country. The map can only be generated for one country at a time. The next thing you will need to do is select one or more business areas for which the scope map should be generated. For each of the presented business areas, simply click the corresponding selection box to include it in the generated scope map. For each scope item that is determined, based on the business areas you have chosen, one box will be displayed in the scope map. The box will include the scope item ID as well as the scope item description. There are then up to seven additional criteria that can be used to represent a specific feature, applicable to the scope item. For example, the content provided with the file will include information pertaining to a scope item being 2 Tier relevant, or it being an integration scenario. You may choose to use one criteria to represent a specific value driver, or a to highlight th fact that you have done some custom code extension or developed a side by side extensibility for this scope item, etc… The choice is yours. You can of course also re-purpose the delivered content. 2 Tier does not apply to you, use that criteria for something else more pertinent to you or your customer. If you also want to generate a Powerpoint slide deck of your chosen business areas, in addition to the information generated in Excel, then simply select the ‘Generate Powerpoint’ checkbox in the Other Options section. Then, in addition to this you can elect to generate the Powerpoint content as pictures or html tables. The essential difference between these two options, is that the picture will be a static element that cannot be changed, whereas the html table option will generate objects that are fully editable in Powerpoint (for example you want to color some scope items in red). To download the needed files, simply click on the icon to the right ! How much does it cost to use this tool? There is no fee associated with the use of this tool. If you do use it, I would appreciate that you subscribe to the SAP S/4HANA CLoud Knowledge Youtube Channel and spread the word on social media. If you would like to make a monetary donation, then I would ask that you make a charitable donation to an organisation that helps with raising dyslexia awareness such as MSL Club in Australia or The Reading League in the USA. Before you ask, no you cannot charge for this tool. How can I change the criteria used? Go to the tab named “SETUP”. Columns L to O map to the free criterias (Criteria 4 –> Column L, Criteria 5 –> Column M, etc…). At the intersection of your criteria and scope item ID, put an ‘X’ in the cell if your criteria applies. NOTE : It has to be an X – anything else will not be taken into account. How can I change the look and feel of the generated Powerpoint? If you want to use your own template, then create your own .potm file in Powerpoint, with the look and feel you want to give it (colours, fonts, logo…). Then save that file in the same folder where you have saved the Excel file, and name it “Template.potm”. The macro looks for a file with that exact name, in the same folder as the excel document. Can I use the generated outputs? Yes, you can use the generated output for your S/4HANA Cloud Projects. But note that this tool is not created, provided, endorsed or supported by SAP. If you use it, then you are responsible for checking the accuracy and veracity of the data that you will generate and use. I have found a bug. Can I change the code? Yes, you sure can ! The code is available and open. You will also note that my code is fairly “dirty”. If you do find a way to optimise the code or correct a bug or add a new features to it, then please send me an updated version of the excel document, so that I can update the source file and the entire community can benefit from this ! There are things I like, some I don't. Can I provide you with feedback? A well thought out critique is worth Gold (E.Musk). Any feedback as long as it is not offensive is welcome, good or bad. You can leave a comment here or on the video on YouTube.